Lee Molyneux is hoping his inside knowledge can help Morecambe finally beat his former club Accrington next season. The 26-year-old winger has signed a two-year deal with the Shrimps after his short-term deal with Tranmere came to an end. A former Stanley favourite, who once scored two in a 5-1 win over Morecambe, Molyeux now wants to make the Shrimps’ 17-game winless run in the Football League against their Lancashire rivals a thing of the past. The former Everton youngster said: “You’ve always got one team. “I know Southend have never beaten Morecambe so I suppose when they play Morecambe they’re like, ‘here we go again’. “We can’t predict what’s going to happen but I’m relishing playing against them this year. “I’ve got friends their and have a good rapport with the fans and some of them may be angry with me for signing here. Accrington was arguably where Molyneux played his best football, a fine 2012-13 season at the Crown Ground seeing him secure a move to Crewe. But it didn’t work out for the former England youth international as he was loaned out to Rochdale and Stanley before being allowed to join Tranmere in January. Molyneux said: “First time I was at Accrington I felt like I was at home. “Cooky and Leam looked after me and they really encouraged me and kicked me on. “I went to Crewe, things didn’t quite happen, got loaned out, went back to Accrington again and scored goals again. “I know when I get settled somewhere I’ll be able to play my best football. Shrimps boss Jim Bentley has made secret of his admiration for Molyneux with the newest face at the Globe Arena admitting that had a big say in him signing on the dotted line. He said: “My agent said in January that Morecambe were keen so I knew in the back of my mind that he’d taken a liking to me. “I spoke to the gaffer a couple of weeks back and there was slight interest from other places but the gaffer told me what he wanted from the club and where he wanted to take the club and showed the most interest in me. “That’s always nice to know when you’ve got a manager who believes in you and thinks you’ve got qualities that can add to his team. 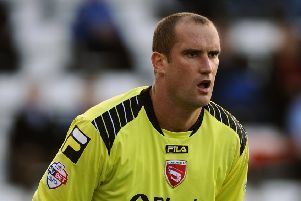 The move to Morecambe will see Molyneux link up again with good friend Laurence Wilson. It was Wilson’s arrival at Accrington in 2013 that saw Molyeux pushed forward from left back, where he started out at Everton, to left wing. Molyneux, who also had spells at Southampton and Plymouth earlier in his career, said: “He (Wilson) jokingly says I can only score when he plays behind me. “That’s a bit of an omen and I wouldn’t mind playing in front of him every week. “I score a lot of my goals from left wing but I’ve played in behind a lone striker, I’ve also played off the right and feel comfortable there. “Sometimes it’s even more comfortable off the right because you receive the ball on your left foot and can cut inside to get shots off and that’s my game. Their combination down the left might have a big say in whether the Shrimps can turn 11th in League 2 in 2014-15 into a play-off run next season. Molyneux said: “Every season they’ve done well. “The club’s stayed in the league, they’ve got players who know the league, and are progressively getting better every year.